Spring, 1958. 21-year-old Rose Pamphyle (Déborah François – L'Enfant, The Page Turner) is living in a sleepy French village with her widower father. Engaged to the son of the local mechanic, it seems her destiny is to spend the rest of her days as a bored rural housewife. Directed by Régis Roinsard, Populaire was very favourably reviewed by our own Timothy E. RAW back in June of this year and said of the film "Roinsard not only excels in period recreation and in giving this bizarre, little-known sport a sense of pace and excitement, he has the good sense to know it's not enough to build a world, you have to tell a an engaging, surprising story." You can read the full review and watch Tim's interviews with lead players Romains Duris and Deborah Fronçois here. 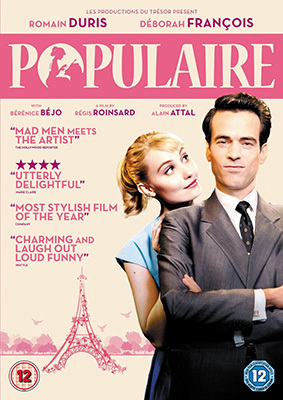 Populaire will be released on UK DVD and Blu-ray on 23rd September 2013 by Entertainment One at the RRP of £17.99 for the DVD and £19.99 for the Blu-ray. Extrea features will include 5 featurettes. What they're about we've not been told.